The original City of the Orcs was built and razed at least three times before King Kurog decided to rebuild in a new location. 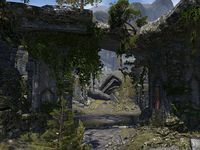 At Old Orsinium most of the surface city has been obliterated, but there are still extensive ruins underground. Old Orsinium is an Orcish ruin in Wrothgar. There are numerous enemies inside Old Orsinium, including spiders, bears, hagraven, harpies and echatere. Deeper inside the city ruins you will also encounter Winterborn and Wrathful guardians of Malacath. Several bosses can be found inside Old Orsinium. Great Zoraluma, a giant spider, can be found at the southwestern corner of Old Orsinium Walls. After entering Hammer's Bypass, a harpy trio Orzik the Storm-Born, Fleshrender and Talonclaw are found inside the southern room. Farther inside Old Orsinium, in the large open hub you can encounter Mercedene the Cursed, a powerful wispmother. On the eastern side of Old Orsinium there is a giant troll Batunalulr. On the western side you will encounter a Winterborn trio of Janavynn, Millengor and Wuhkusto. The last part, Old Orsinium Forges, has several Malacath's Wrathful cultists and Pyre Keeper Rugdrulz. On the eastern side of the forges is a door leading to Old Orsinium Shrine, which you need to visit when doing Flames of Forge and Fallen. A southern exit from the shrine will lead you back to the central hub room. Old Orsinium Objective: Light Malacath's pyre at the heart of Old Orsinium. 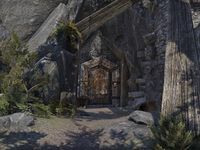 Half of the Ancient Orc style can be obtained in Old Orsinium, with the other half found in Rkindaleft.